Most people associate voice assistants with smart speakers, but Google is looking to expand Google Assistant’s mobile offerings. 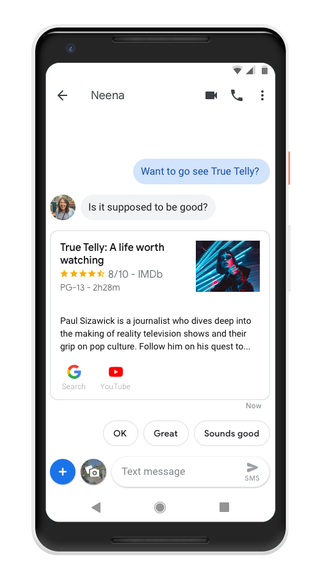 At Mobile World Congress, Google announced it’s adding Assistant into the Messages app in Android, and adding more supported languages. As we reported earlier, Google is also adding voice control to Maps, but it's also adding Assistant to the Messages app, too. Users will be able to see suggestions about movies, restaurants, and weather. So during a conversation, you might see an AI-generated “suggestion chip” pop up that you can then click to share information with whoever you’re chatting to. From a privacy standpoint, that does sound a bit dicey, but Google notes the content of any conversation isn’t sent to Assistant – just whatever suggestions you happen to send. Users will also be able to quickly look up information by holding down the Home button within the Messages app. Google’s also expanding support for bilingual Assistant from six languages to 12. Originally, you could choose to switch back and forth between English, Spanish, German, French, Japanese, and Italian. Now, Assistant will also be able to support Korean, Hindi, Swedish, Norwegian, Danish, and Dutch. Google is also adding support for seven more Indian languages, so you can now speak to Assistant in Marathi, Bengali, Tamil, Telugu, Gujarati, Kannada, Malayalam, and Urdu. While Amazon Alexa used to reign queen among voice assistants, Google’s been making some serious strides with Assistant over the past couple years. This push into mobile is the just latest step in Google closing the gap between it and Amazon.